As the days remaining in 2013 approach single digits, it is perfect time to see some of the best of articles that I have written in 2013 that created maximum interest among the readers. 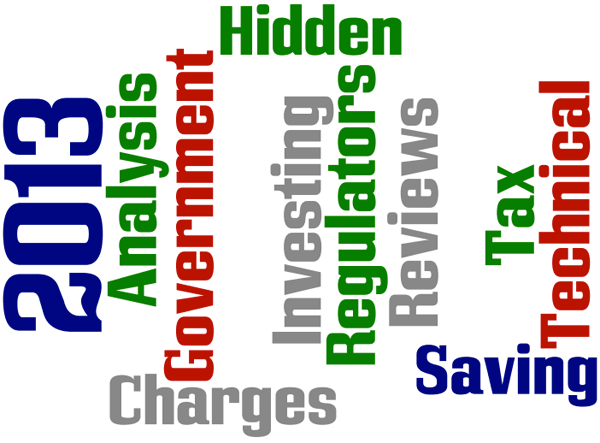 The Best Tax Saving Mutual Fund ELSS Options for 2013 is one of those kind of article that I normally share each year between January to March timeframe and it always has been discussion point for quite sometime then. Yes I have quite a few emails for this year’s Tax saving option and as soon as I invest, will have that shared in the blog. When it comes to using technical analysis, there is always a doubt among investors but not as much for trading and my article where I shared How I Use Technical Analysis of Nifty for Longer Term Investing busted all those myths among investors. According to me everyone is a newbie in markets including myself. I still think I have lot to learn from markets and improve constantly. When I share Golden Rules To Picking Best Stocks, it becomes quite popular almost instantly because readers can relate how the rules will be in the newbie friendly language to understand and not include those big big jargons. Book Reviews is always preferred by members here and the review of the book How to Be Your Own Financial Planner Book in 2013 was no difference. Published Zerodha Review last week only but it has already become popular especially among the existing customers who really like Zerodha Services. Anything you write about the shortcoming of any Indian Government or regulators always kicks in lot of readership and my article about How Fake Currency Circulation From ATM’s Can be Avoided was no different but I just did not criticize the process but also provided with a real simple solution that the Government and regulators will not be able to put into practice to help the common man and so a common man has to keep losing money. We all want to be buying a property and knowing the Hidden Charges When Buying a Property was something that showed lot of interest among readers. Is there any other article of mine that you liked but I have not included in the list above? Share the article in the comments below and may be a line or two about why you liked that article. I have stopped recommending Zerodha from June 2016 and you can read the details of why I have stopped recommending.